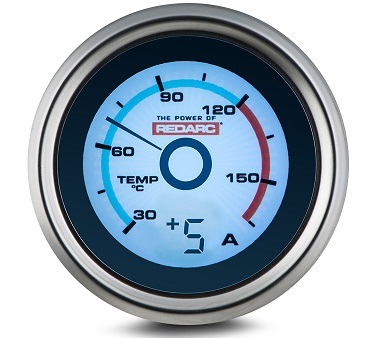 The REDARC 52mm G52-TA gauge monitors engine oil and is equipped with an optional 100 amp rated current display to monitor the amount of current to or from a battery. The G52-TA gauge is supplied with one REDARC 1/4 NPT thread temperature sender that measure from -30 to +160°C. Oil subjected to excessive temperatures can lose its lubrication properties that keep metal parts from touching. If the oil temperature rises above the desired limit, you can reduce the load placed on the engine or transmission to reduce the temperature and prevent engine failure. Similarly, monitoring the water (coolant) temperature of your engine ensures that it does not over heat, resulting in major engine damage. The G52-TA gauge is also equipped with an optional 100A rated current display that monitors the amount of current to or from a battery. This device can be fitted around the earth connection of either the main or auxiliary battery. You will need to purchase the REDARC Hall effect current sensor (GS-AMPS) to equip the gauge with this function. The G52-TA gauge diameter requires a 52mm hole for mounting. REDARC offer a range of mounting solutions including a 2” black plastic mounting cup (GH-CUP) and one (GH-MP1), two (GH-MP2) and three (GH-MP3) hole gauge mounting panels. Radio inserts are also available that suit the Toyota Hilux (GH-RI05).